Easybots makes it easy to automate tasks and create personal software solutions by connecting bots. Bots are "software robots" that fire triggers and execute actions. Download Bots or Make Your Own! Using a visual programming editor, you create software solutions by drag&drop of triggers and actions in a flow. 1-Year Pro Membership for FREE! 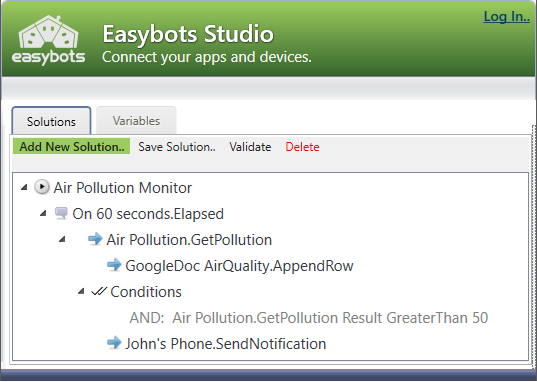 Example 3: Log Pollution to GoogleDocs, and notify on mobile if bad air. This is a showcase how Easybots Studio can be used to create a 'file monitor' solution with Visual Flow-Based Programming. Watching on desktop? 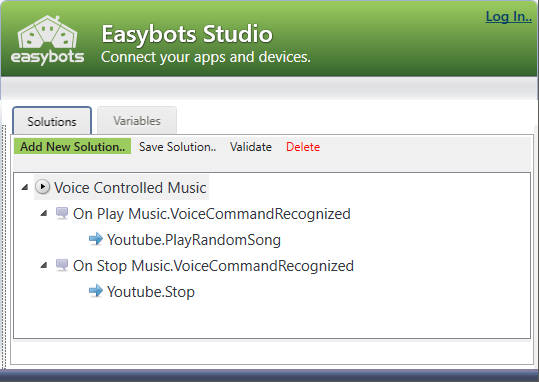 Click here to see the examples in Full Easybots Studio View..
PRE-REGISTER and get 6-Months Pro Membership Free!